I'm new to SolderSmoke, and have made it up to episode 135. around episode 130 you entered a "space" phase that I enjoyed. 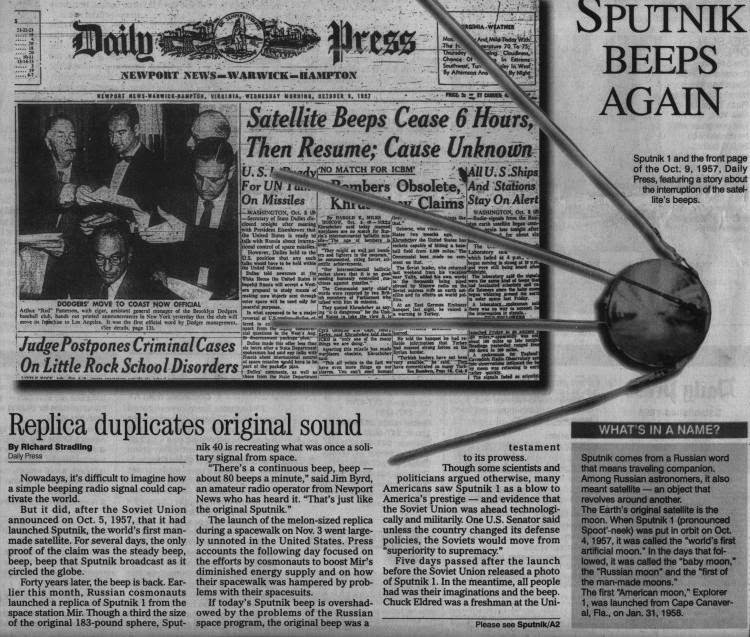 With Sputnik being mentioned, I thought I would send you a recording of Sputnik 40 that I made on November 23, 1997. I used a home made turnstile antenna and an HT. Sputnik 40, also known as Sputnik Jr, and Radio Sputnik 17 (RS-17), was a Franco-Russian amateur radio satellite which was launched in 1997 to commemorate the fortieth anniversary of the launch of Sputnik 1, the world's first artificial satellite. A 4-kilogram (8.8 lb) one-third scale model of Sputnik 1, Sputnik 40 was deployed from the Mir space station on 3 November 1997. Built by students, the spacecraft was constructed at the Polytechnic Laboratory of Nalchik in Kabardino-Balkaria, whilst its transmitter was assembled by Jules Reydellet College in Réunion with technical support from AMSAT-France. Sputnik 40 was launched, along with a backup spacecraft and the X-Mir inspection satellite, aboard Progress M-36 at 15:08 UTC on 5 October 1997. A Soyuz-U carrier rocket placed the spacecraft into orbit, flying from 1/5 at the Baikonur Cosmodrome in Kazakhstan: the same launch pad used by Sputnik 1. Progress M-36 docked to Mir on 8 October, and the satellites were transferred to the space station. At 04:05 UTC on 3 November, during an extra-vehicular activity, Sputnik 40 was deployed by cosmonauts Anatoly Solovyev and Pavel Vinogradov. On 4 November, the day after it was deployed, Sputnik 40 was in a low Earth orbit with a perigee of 376 kilometres (234 mi), an apogee of 382 kilometres (237 mi), an inclination of 51.6 degrees, and a period of 92.13 minutes.The satellite was given the International Designator 1997-058C, and was catalogued by the United States Space Command as 24958. It ceased operations on 29 December 1997 when its batteries expired, and subsequently decayed from orbit on 21 May 1998. The backup satellite remained aboard Mir, and was destroyed when Mir was deorbited on 23 March 2001. I really enjoyed the latest SolderSmoke! I think you two have got a winning formula, humour interspersed with valuable technical knowledge. Some podcasts are just too serious, there's nothing wrong with having fun in your hobby! Progress is slow here, as always, but each week I have managed to move a little bit further forward. This week I aligned my BITX band pass filter and made a rough measurement of my crystal filter using the DDS signal generator that I built last week. My oscilloscope is a Tektronix 465, older than me I believe! Of course there is no fancy signal level readout like the modern digital scopes, so I had to just peak the injected signal through the crystal filter and measure the frequency using a frequency counter connected to the IF amp. I followed the BITX ver 3 build instructions and my results seemed to match very closely to the Indian kit. I'm going to set my BFO at the -20dB from peak level as suggested in the ver3 instructions, I guess I can fine tune the setting later. At first I had no signal making it out of the last RX IF amp, I traced the signal right through to the base of the first transistor but then the signal was lost. I had thought that band conditions were poor when I tried my BITX in RX last week when in fact it turns out that I'd made a small mistake building the IF amplifier that follows the crystal filter! I had wired the 4k7 resistor in the wrong place! I made the circuit good and hey presto, lots of signal coming out of the amp! I was eager to give the receiver another try. On Fridays work finishes at 1pm, so a great chance to try out my rig during daylight hours. I hooked up the rig to a random piece of wire and I was amazed by the great noises coming from the speaker! I hadn't even set the BFO but voices were just leaping out. Man that rig has a lot of AF gain! I obtained a switched 10k log pot which I intend to use for power on and AF gain so hopefully the volume control will be OK. As a side note, it was nice to hear HF0YOTA down in the CW portion, I'm guessing that it is youngsters on the air station, I must do a search on the call later. So the little signal generator has already earned it's keep. I guess I can would have been scratching my head for a while without it! Be prepared to be occasionally amazed. Back in the late 70's I worked all over the western U.S. with under 1/2 watt. Regularly. Even a QSO with a UA0 (Siberia) with under 1 milliwatt, he having answered my CQ! I was seeing if I could "get out" using a single "D" cell flashlight battery that was too weak for the flashlight. All using a colorburst crystal. Oh, and a dipole 100' high stretched over a creek. No contacts yet but it sounds good into a dummy load. HA! Thanks again for the inspiration to heat up the soldering iron once more. No cost! That's the HB spirit! I like the LPF and that pill bottle modular construction is very cool. This is the perfect time of year for CBLA operation on the QRG. Now that is what I call "cost effective". It works so why not! Thanks for the heads up regarding the SMA connectors and cables. I will definitely do that. Will probably use my first Si5351 as a network connected signal generator and get another Si5351 module to put "on the air". FYI - rather than using Arduino (or some other microcontroller) I have been using recycled ADSL routers for my Si5351 and MEPT beacons. DLink DSL-502T specifically. These were the standard broadband router down here in ZL about 5 years ago but are now essentially free on the local auction site because everyone wants WIFI. They can be flashed with OpenWRT (a Linux derivative). They have enough GPIO pins that with a bit of configuration can easily control the Si5351 and other I2C devices. Bill talks about "road kill computers".... these are "road kill routers" but at $1 each you can't really go wrong. Just like in "How's DX?" 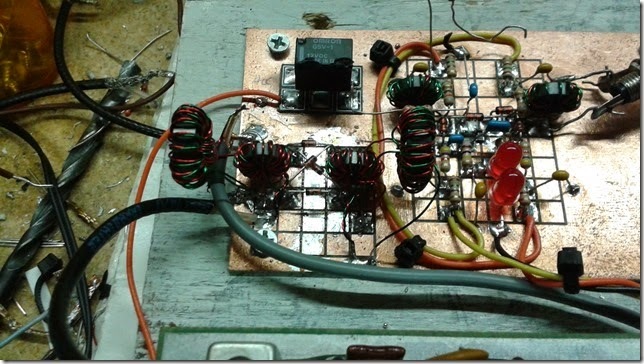 VE7BPO's QRP POPS IS BACK! I wrapped up my Samana HI9 operation yesterday morning. I found a very friendly Spanish-language round table - they were all willing to try to pull my QRP DSB sigs out of the noise. Within a few minutes I worked KI4PZE, CO8OT,WA4RME,and CO8KB. So that made a total of 18 solid contacts with 3 more that might not qualify as full-fledged QSOs. We have moved on to very urban Santo Domingo - no room for antennas here! From the November 1964 issue of 73 Magazine, by way of a compendium book sent to me from New York City by Dave W2DAB, comes words of wisdom about how to make a simple, super-stable VFO. Lots of great ideas in this article. My favorite was running the thing off D cell batteries and leaving it on all the time! The article was written by Roger Taylor, K9ALD. Thanks to Dave, Roger, Wayne Green and the Internet Archive. I did the modification and used 20 bifilar turns of #26 on a FT-50-43 core for each transformer. The most important observation is that I did not see any degradation of performance and in fact I think has helped an overloading situation I was seeing on some extremely strong signals. The photo is of a DBM that is behind a bilateral stage that on Rx is the RF amplifier and on Tx is the Tx pre-driver. I do have another single transistor RF amp ahead of this. In normal operation the next stage would be the Band Pass Filter. 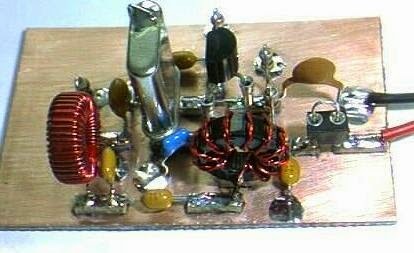 The back end is an IF amplifier, AGC, Product Detector, balanced modulator and mic amp stage all on a board that came out of a Hallicrafters FPM-300 SSB/CW transceiver. There is a you tube video of this prototype project. Current portable ops in Samana! Also. Today is Pete Juliano's birthday! Send him greetings! the one I built a few months ago. The wattmeter claims it’s putting out 700 mW into a dummy load. Even with the filter, I’m still hearing a strong signal on 14.216.
hearing on the shack reciever. You guys are putting out some great podcasts! keep up the good work. Hi guys, thought I’d share my story about two free toilets, Home Depot, the record breaking rainfall, and my failed attempt to join the Colorburst Liberation Army. The short version, is our local water company gave away free low flow toilets today, and in my process of (absolutely failing) to install them at home (give me solder over plumbing any time!!) ran to Home Depot for some parts. In the parking lot, someone had smashed a television set, and I suddenly recalled your story about how old televisions use 3.579Mhz crystals!! However, it appears the rain the TV had been subject to in the last few days (or maybe the smashing) changed the crystal in question somewhere in the range of 10.2Mhz to 10.4Mhz... So no go! But an amusing adventure anyway, and I do have a random 10.4Mhz crystal to show for it. 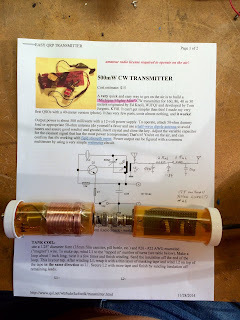 Back in 2000, the NJQRP club came up with a nice little transmitter called the SNAP. It was designed by Chuck Adams K7QO. Dave K5YFO alerted us to it and suggested it as an alternative to the Mighty Midget. One advantage over the MMM is that the SNAP needs no variable capacitor. But it does need a couple of coils wound on toroids. The SNAP design includes a low pass filter, something that has to be added on to the MMM. Check it out. Even if you've already built the MMM, you could easily take the crystal and use it in a SNAP build. Earlier we wrote about QRP POP's reemergence in blog form. Wow, beautiful job Bruce. I was hoping that a check of the Reverse Beacon Network would reveal that someone had heard you, but no joy. Keep at it. You may become the first CLA member in this round to make a contact. Hello from the Midwest chapter of the CLA. Here's pix of my just completed Michigan Mighty Mite. Nothing was purchased specifically for this project. It was put together using only parts already on hand. The only previously unused parts were the front panel sockets and one resistor. The rig uses a 2N2219A transistor salvaged from a junked industrial control board and a color burst crystal that actually first oscillated in a tube-type color TV some 40 years ago. Loading into my ground-mounted vertical, this MMM seems to be most stable at a draw of 87ma at 12.6 volts. The arithmetic seems to work out at somewhere around 650mw into the ether. I called for about half an hour around 2300Z, but got no takers... it was still pretty early for 80m and I had an extremely high local noise level. The rig seems to run about 1khz high. I'll give it another go this weekend. 72 - Bruce - KK0S. Yikes! This is really good! Thanks to Harv for sending us this link: Poor Shep! Have been loving each Soldersmoke Podcast and Blog Segment recently. You and Pete have made the program a superb treat while I've been busy with the Radio Room construction. I encountered two water breaks in the Radio Room while construction was under way but, that is a whole different story. Fortunately none of my prized boat anchors were damaged. The project; (The Radio Room), includes operating positions for 14 complete stations. That wouldn't be too bad except I'm constructing walls, benches and over-head lighting from complete scratch. While this is going on, I wanted to finish my 3.579 MHz CBLA transmitter and return to the Minima build that I started in April 2014. However, in September, I retired and moved to another state. The reality of the latter took awhile to sink in. Most Ham Projects took a back seat to higher priorities. I will soon have the Radio Room I always dreamed of. The Drake 2B fills the space with the sound of 20 Mtr CW and the anticipation of having the HT-37 brewing away is just around the bend. I'm taking a short sabbatical from the Ham Shack construction to get caught up on some other household projects. 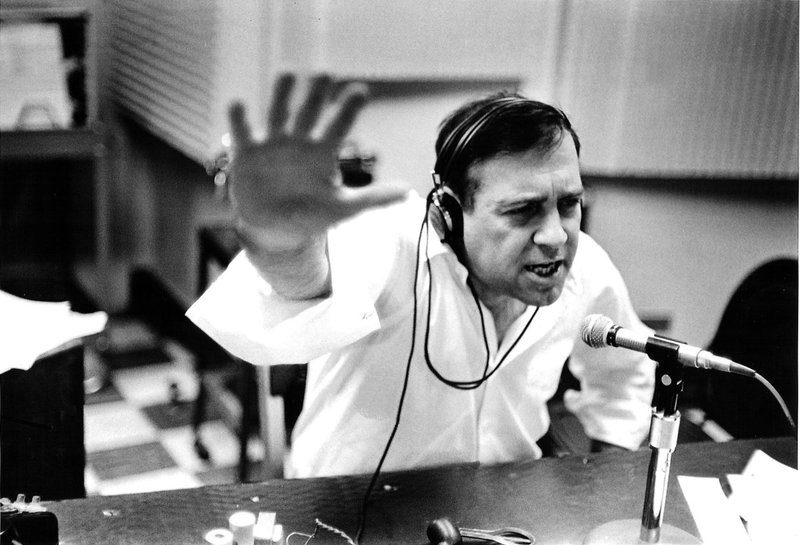 In this notion of taking a needed break, I rediscovered Jean Shepherd's programs on Youtube. I started to dissect Sheps monologue when I found that familiar path in my own life as a 15 yr. old Ham in the mid-1960s. I'm sure you too can relate to Jeans' life as a kid. Dad hammered him over the damage to the house by the lightning strike. I'd love to hear the rest of that story!!! Please keep up the great efforts with Soldersmoke and bringing us all that good Tribal Knowledge. I think we should all go build something. Looking forward to what's next. Thanks to You and Pete. 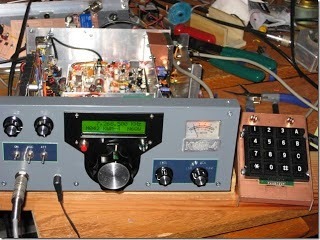 Steve W1KF's Connecticut Mighty Mite is the neatest build so far: it has a front panel and knobs and plugs and everything! Pete Juliano commented: "Very cool –and elegant. I loved the transistor in a front panel mounted socket with heat sink. Wished I had thought of that –great idea." Steve is on the air at grey line times, looking for contacts at 3.579 Mhz. Sent to us by Ben Tovar. Soon to be available in EE-book (get it!) Thanks Ben! -- Minima IF evolution -- up to 25 Mhz? -- Chuck Adams and "Experimental METH"!!!!!!!!!! -- First menus, now KEYPADS! -- Video review: "The Wanderers"
EL CLA UNIDO JAMAS SERA VENCIDO! The Saturn V was, of course, far more impressive and beautiful. But the Orion is pretty cool. When I was looking at the drawings depicting the various stages of the spacecraft, that Apollo-shaped capsule brought back some deep memories. I was 10 years old when Apollo 11 launched. 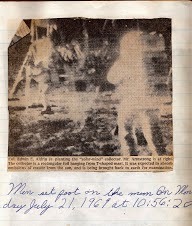 A page from the scrapbook I made during the flight of Apollo 11. I'm starting to worry about a visit from Homeland Security. I found this on the blog of W6IEE. He blames K6FWT. Up the revolution! Fight the Powers that Be! Click on the video above to see and hear it in action. Manhattan Mighty Mite: "Rockin' the Big Apple on 3.579"
Dave W2DAB got his Manhattan Mighty Mite oscillating nicely! Hooray! So far we have sent out 20 colorburst crystals. Already we have two circuits oscillating (not counting Pete's and mine). CLA is on the march! Thanks for all your help, I can joyfully announce the birth of my first Michigan Mighty Mite, Oscillating at the frequency of 3.579! Yes, Pete’s sage advice to flip the coil over was a great help and also my good friend from Vermont (A Michiganian by birth ). OK, so Bill… you remember your most embarrassing moments in home-brew? Well, here’s mostly what happened: I was reading the article I found online and somehow got 40 meters stuck in my head even though your colorburst was for 80 - So I build a 40 meter coil. When I realized my mistake I thought - well why not build two of these so I pulled out the Colorburst and put in a Norcal 7.040 and then built a new board with a new 80 coil oriented properly and the pic below is the one you see. Now I have two Mighty Mite’s that work, how great is that. My next goal is to continue forward using Pete’s Build Something Video’s, so more fun to come. I will post a video on my blog of the 80 Meter Colorburst Michigan Mighty Mite uttering it’s joyful tones, but for now I’ve put a lovely photo at the bottom. Success is sweet when you hear the sounds of the beep! I've amassed the parts for my 12v Regen Rx inspired by a projects from VK3YE and an audio amp, using a pair of 12AU7's. I'll publish more about that soon on my blog. In the mean time, I'd like to thank you guys for inspiration on the si5351 VFO in use with various projects. After we found the first articles by NT7S, we discussed that there are a lot of possibilities. I've just finished my build of an Arduino controlled SDR transceiver prototype using the Si5351A. This week I'm tinkering with the LPF for 20meters. Puts out a whopping 20mW. Everything is on schedule for the presentation using this SDR at Linux.Conf.Au next year. Got some coding to do to add I&Q for the SDR side over the summer break. So yesterday Pete and I were talking about Dave W2DAB's Michigan Mighty Mite malady. Dave is tantalizingly close to the joy of oscillation. Wizard that he is, I think Pete diagnosed the problem with his eyes closed from 3000 miles away. I sent Dr. Juliano's prescription to Dave this morning and expect the concrete canyons of Upper Manhattan to be ringing with pure 800 Hz tones as soon as Dave fires up his soldering iron. Anyway, I then told Pete that I'd been looking through my bookshelf for something suitable for my 11 year-old nephew Sebastian. I found something for him, but I also came across a book that was too advanced for the young fellow: "The Master Handbook of Ham Radio Circuits." TAB Books, 1977. By "The Editors of 73 Magazine." Between turkey sandwiches I started looking through this book. 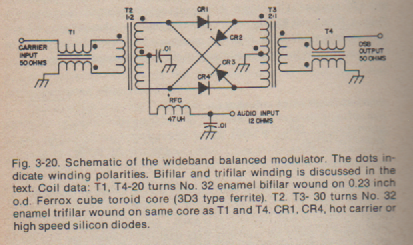 I immmediately found an article of interest: "A Better Balanced Modulator." The author (unnamed) looks closely at the performance of our beloved and much-used diode ring mixer with dual trifilar transformers. He concludes that the unbalanced input and output coils (in the traditional configuration) detracts from the balance needed for optimum carrier suppression. He suggest the use of baluns at input and output (see above) and claims significant improvement in carrier suppression. Very interesting. (If anyone wants to dig into this, e-mail me.) There is also a very simple solid-state VFO circuit that promises phenomenal stability. Anyway, I found myself trying to remember where this great book came from. Then I remembered someone sending it to me. A quick check of my e-mail revealed the source: Dave W2DAB sent it to me three years ago. Thanks again Dave! 35 % off on "SolderSmoke" (the book! 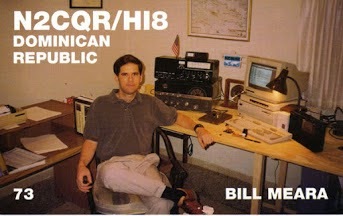 ), "Contra Cross", and my new book: "Us and Them"
I really liked the description of his progress as a homebrewer, and the way he was helped by G-QRP, SPRAT and Ian G3ROO. FB. Ben's Mighty Mite -- IT IS ALIVE! Ben KD9JNQ is the first of the Colorburst Liberation Army (CLA) recruits to get his Michigan Mighty Mite to oscillate. So he has been promoted to Colonel. Bill and Pete, thanks again for the encouragement! I decided to start off slow, with small projects that seemed likely to succeed. 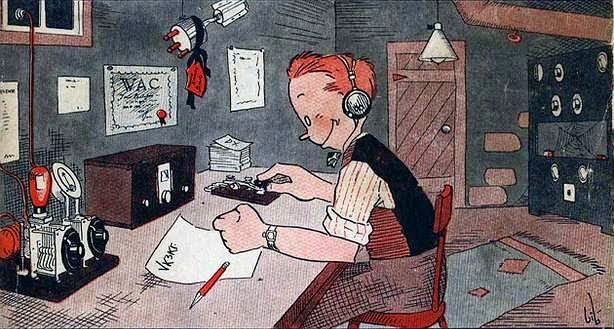 The secretary in our office in the Embassy, Mady Bullen, had an interest in ham radio that had been sparked by service in far-off places where short-wave was the only way to talk to home. She would pass me old issues of CQ magazine. It was in the March 1992 issue that I found the Michigan Mighty Mite. 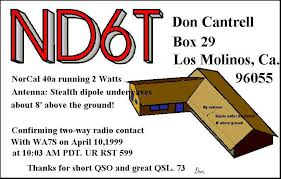 It was originated by Ed Knoll, W3FQJ and developed by Tom Jurgens, KY8I. 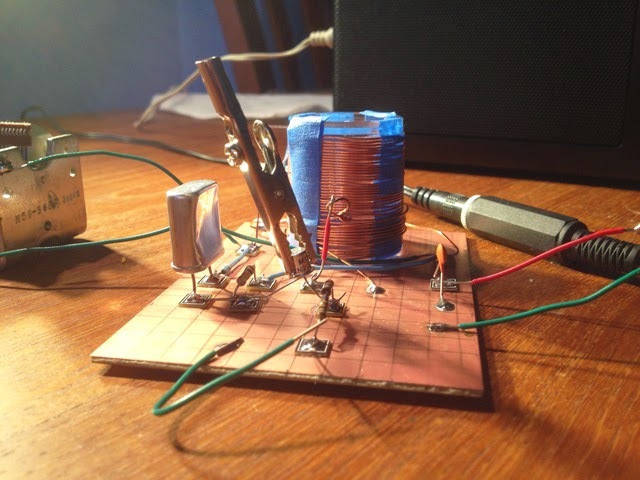 It is about as simple as you can get in a radio transmitter: just one stage, a crystal controlled oscillator. An oscillator is basically an amplifier in which some of the output signal is fed back into the input. If you provide enough feedback in the right way, the amplifier will “take off” and begin generating a signal. The howl you hear when the microphone of public address system gets too close to the speaker is this kind of signal. The speaker (the output) is sending energy back to the input (the microphone) and what was an amplifier turns (annoyingly) into an oscillator. In this case it is an audio frequency oscillator because all the filters and tuned circuits in the PA system are built for the audible frequencies. But the same thing will happen at radio frequencies. That’s what the Michigan Mighty Mite is all about. I put the thing together using parts obtained from the Santo Domingo Radio Shack store. The resonant circuit used a coil that was just some wire wound around a discarded plastic 35mm film container. Homebrew radio projects rarely work the first time you power them up. I had to fidget with this thing quite a bit—obviously there wasn’t enough feedback. I had my Drake 2-B on and tuned to the crystal’s frequency. As I poked around on the little circuit board, I suddenly heard a little chirp from the 2-B. There it was! 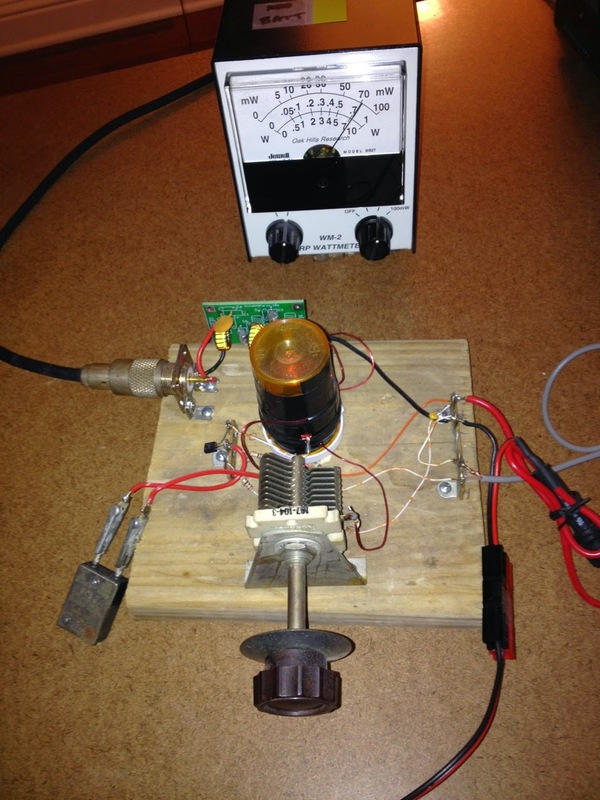 The little device that I had put together was producing radio frequency energy on the 40 meter band. Hooray! 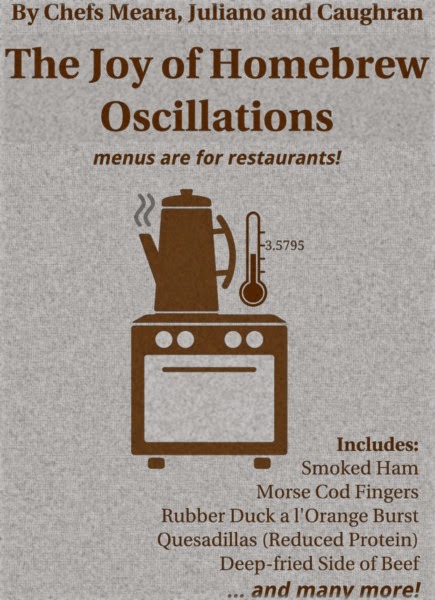 The joy of oscillation! Now I felt like I was truly in league with Faraday and Marconi, with Shep, Stan and Bollis, and with Serge! Hilmar would have been proud of me (but he still would have been horrified by my sloppy wiring). I never was able to talk to anyone with that little device—the power output was very low, and my antenna for the 40 meter band was very poor. But it didn’t really matter. I had had my first real success at homebrewing a piece of ham radio gear. I was hoping that this rig might oscillate even without the variable capacitor, but mine did not. Once the cap was placed in the circuit, the oscillations began. It sounds pretty good on my Drake 2B. I have not yet wound the secondary (antenna) coil but (as I suspected) the oscillator works fine without it. So, no excuses folks. These cheap junk box crystals work. 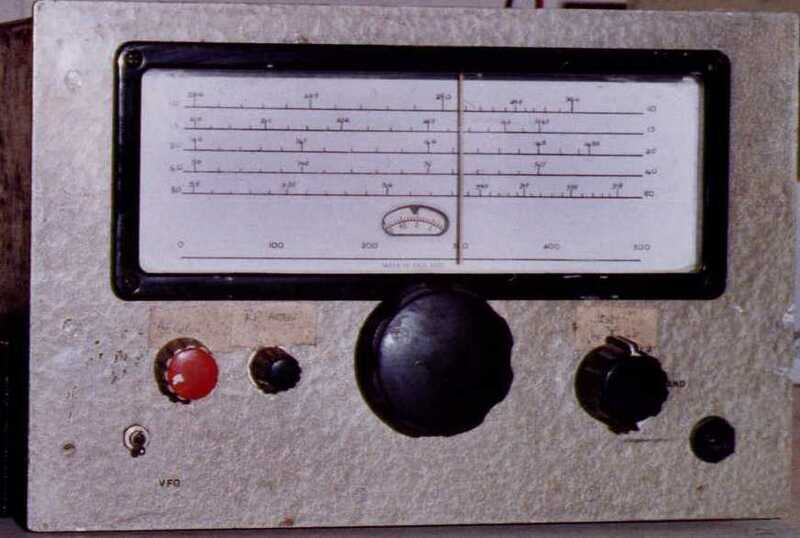 Time to build one of these things and join the ranks of hams who have homebrewed a transmitter (and, of course, The ColorBurst Liberation Army). Wow, quite a bit of progress at M1BUU since our last look (see below). I must admit, that Arduino DDS board looks quite nice sitting there in the VFO territory. In his original BITX20 article Farhan recommends a pause before the construction of the final portions of the transmitter -- the builder is advised to sit back and enjoy the receiver that has just been created. Colin is at that point! Congratulations Colin. He has noted that his board is a bit(x) smaller than mine. Maybe he should stick with Farhan's recommendation and build the PA and driver on a separate board. This will also help prevent the dreaded oscillations -- no need to tempt fate or anger the radio gods! Another great SolderSmoke episode this weekend, I really like the humour between you and Bill! I listened to SS whilst melting solder on my BITX project. I had really wanted to get my BITX working as a receiver before the end of the weekend, but Lewis Hamilton and his (successful) bid to become Formula 1 World Champion, put an end to that idea! I also decided that I wanted to buy some better quality capacitors for the band pass filter, so I've ordered them today. I fired up the receiver chain for the first time this evening from where the BPF should be, right through to the AF amp, I'm pleased to report that I seem to have created a working superhet receiver! I heard some BC breakthrough at certain points of the tuning range and the rig receives the second harmonic of my Rishworth Buildathon 40m transmitter beautifully (on right part of dial too!). I hadn't tested the RX IF amps or AF amp before, but they seem to be doing just fine. I'm so pleased to have got so far, and I'm very pleased with the build. 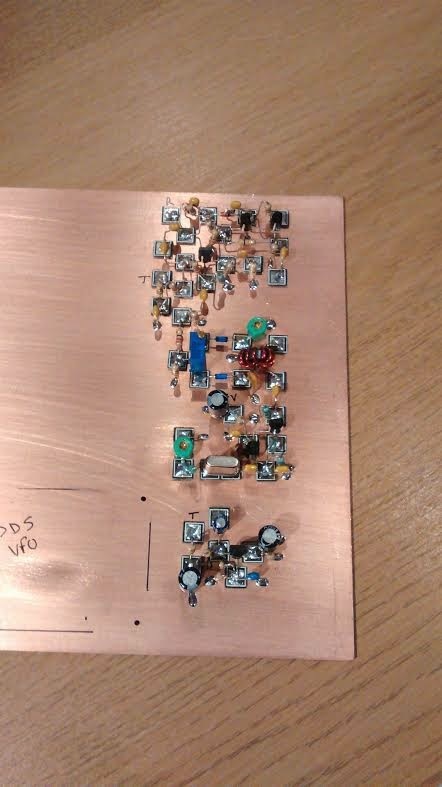 That big copper clad board doesn't look so big now, but I think I have room for the TX/RX switch, BPF, RF driver, RF PA and LPF which I still need to add. Thanks for the encouragement and advice so far, I doubt I'd be feeling so elated at this point without it! This is going to be a really cool rig! Two words come to mind: Absolutely Superb! Wow that is such a work of art. I may never show another one of my projects as you have set the standard and benchmark. You also have demonstrated building from the back end which we discussed in SS168. Now what you have built is a part of the test system. Really outstanding. Be sure and video your 1st qso and share on You Tube. The MMM was built – took me a long time (about 30 Minutes so it was kind of slapped together). The most time was consumed drawing squares on the sheet metal. I used a pill bottle cut down for the coil. Used a piece of Home Depot sheet metal for the based. I highly recommend a .01 Ufd from the 27 Ohm to ground –key clicks are awful. VIVA EL EJERCITO DE LA LIBERACION DEL COLORBURST! VIVA EL CLA! New recruits have been signing up for the Color Burst Liberation Army. We have been sending out many more 3.579 MHz crystals. Pete Juliano was doing some noodling and came up with this plan for Manhattan pads or Me(Maine)Pads. All you need is some copper clad board, a pair of Home Depot tin shears and some super glue. Cut out the pads, glue them down, add components and get the Mighty Mite percolating. FINALLY! A Computer Made with Discrete Transistors! 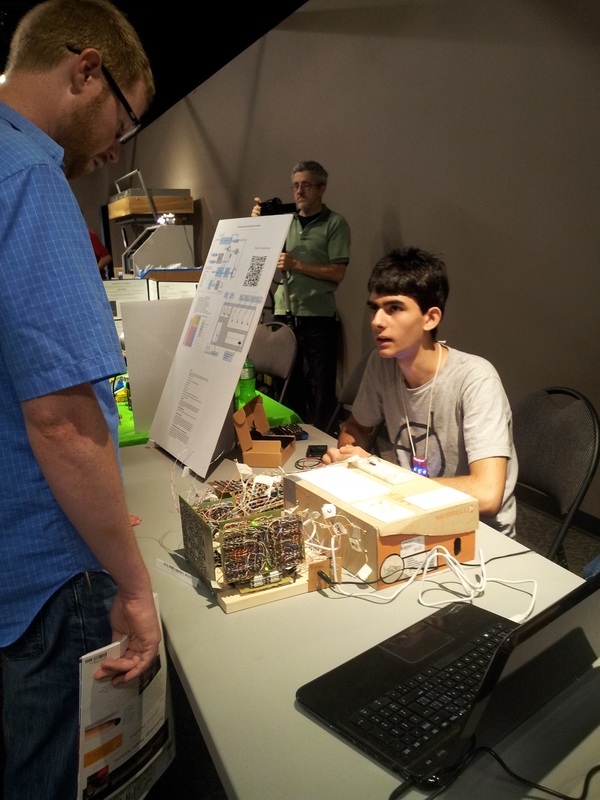 Note the discrete BJT transistor T-shirt. Note the haunted, obsessed look in his eyes. This fellow is building a computer out of discrete transistors. He clearly has The Knack. SolderSmoke Podcast #168 Software Inefficiencies! DSB Blues! Schematic Errors! QRO Confessions! SolderSmoke Podcast #168 is available. The benefits of software inefficiency. Don't throw a wet blanket on computer baby steps. DDS-ing Pete's old boatanchors and Bill's BITX. 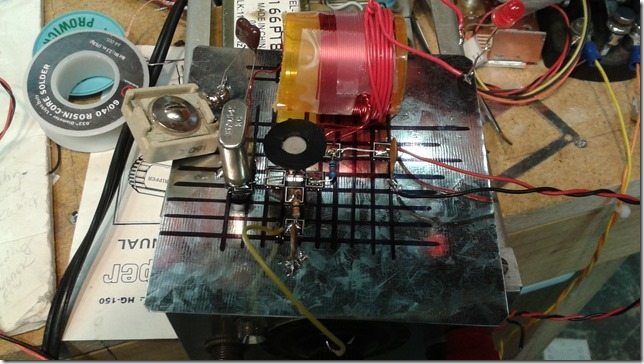 Bill's DSB amplifier woes: a JBOT unfairly scorned. Getting ready for solar-powered beach DSB. Michigan Mighty Mite Crystal Offer -- FREE ROCKS! 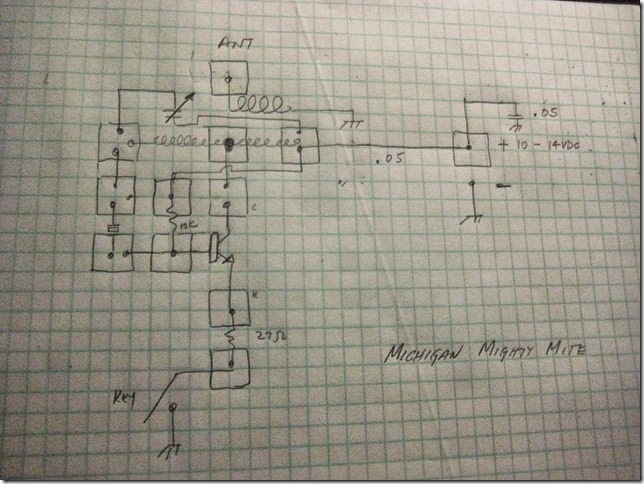 Tribal knowledge: Beware of mistakes in published schematics! QRO update: Working Japan on 17 meters. Beautiful use of a cigar box by Ben, KK6FUT. Ben is working in close proximity to Pete N6QW and has obviously fallen under the influence of Pete's "Build Something With Tubes" field. Watch out for the high voltage Ben. You aren't in Arduino-land anymore! One hand behind the back OM! 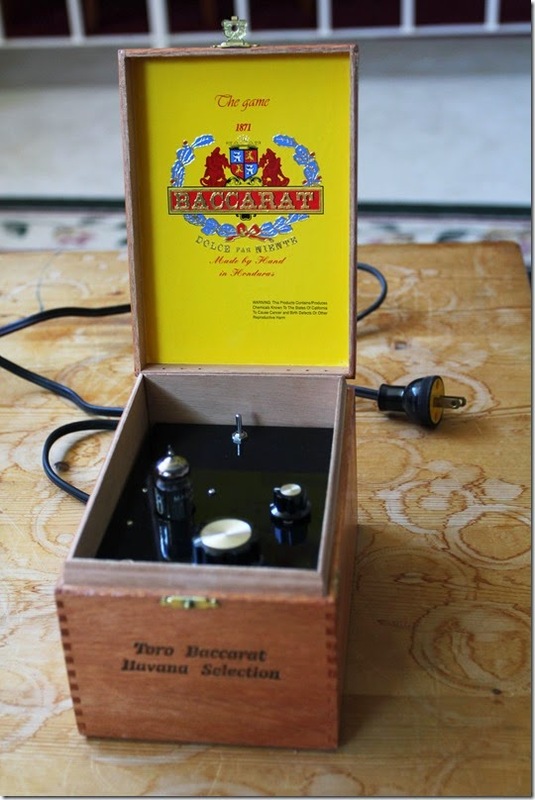 Impedance Matching Transformers -- Pete's Magic Decoder Ring! Broad Band Impedance Matching Transformers. Broad Band impedance matching transformers are designed to transfer power over a wide frequency range. More basic you have an amplifier that has an output impedance of 200 Ohms and you want to match that to a 50 Ohm load. So what is the magic decoder ring so that you get a 4:1 match, ie going from 200 Ohms to 50 Ohms. Getting technical for a moment the maximum power transfer theorem says maximum power is developed when the source is matched to the load. The Broad Band Matching transformer enables that to happen over a wide frequency range. So how do we get from 200 Ohms (the source) to 50 Ohms (the load)? Just as there are many airlines that fly from LA to NY so it is with the matching approach. We will cover several. First a short discussion about broadband cores themselves. One of the most common cores for HF work is the type 43 core which is good up to about 50 MHz. For transformers up to 200 MHz then the type 61 are a better choice. Typically at HF the FT -37-43 is one of the more common ones see (3/8 inch in diameter), as is the FT-50-43 which is ½ inch in diameter. The iron powder cores are not the 1st choice for broad band matching. Build a transformer that has a primary of x number of turns (and since it is large, 200 Ohms will have more turns) and the secondary will have y number of turns ( and since it is smaller, 50 Ohms, will have fewer turns.) The transformer action is based on the ratio of the Primary turns Squared to the Secondary Turns squared. Our transformation is 4:1. Thus if we divide the primary turns squared and divide it by the secondary turns squared the result is 4. Here are some example: if we had a primary of 8 turns ( 64) and a secondary of 4 turns (16) – 64/16 = 4. So that is our transformer a primary of 8 turns and a secondary of 4 turns. When building these transformers use two different colors of wire as that makes it much easier to identify the windings. Observe the phasing, meaning the end you connect to the collector of your output transistor is the start end. That same start end for the secondary winding is the output “hot” side of the secondary. The same ratio holds in going from 200 to 50 Ohms. But this time we will use a single winding of 8 turns and at 4 turns we will have a tap for the 50 Ohm point. Since that tap will very likely have Dc on it connect a 100 NF cap at the 4th turn winding and this is the output. What you have just done is create an auto transformer. At time one may have an oddball transformation and you can cascade transformers and multiply their individual turns ratios. At one time I needed a 9:1 transformation. I built a 2.5 transformer and then hooked that to a 4:1 and the result was a 9:1 transformer. The attached table has “worked out” some common matches that are often needed like matching a 50 Ohm amplifier to a 500 Ohm Crystal Filter which is a 10: 1 match. This is easily done with a 6 turn primary (50 ohms 6^2 = 36) and the secondary has 19 turns ( 500 Oms 19^2 = 361). 361/36 = 10.03:1. Close enough for ham radio! The 1st way is probably more preferable for this application.